Jamuna Bank Director Eng Md Atiqur Rahman is seen at the inaugural ceremony of a free-eye camp on Wazuddin Foundation Trust Islamia Madrasa and Hefjkhana premises at Daudkandi in Cumilla. Jamuna Bank Foundation organised a free eye camp at Wazuddin Foundation Trust Islamia Madrasa and Hefjkhana at Daudkandi in Cumilla. Eng. Md. Atiqur Rahman, Director, Jamuna Bank Limited, was present as the chief guest on the occasion, said a press release. 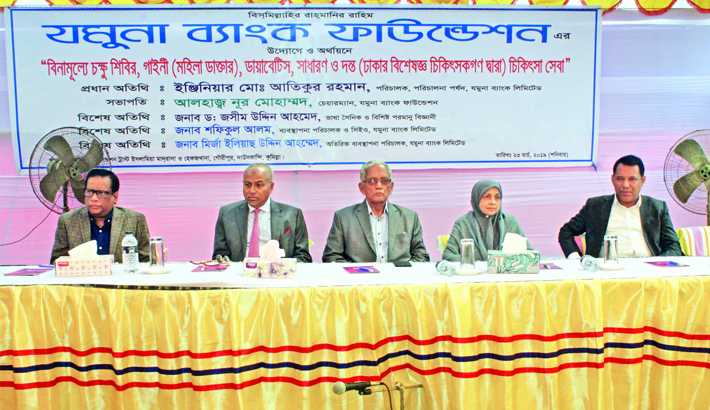 Nur Mohammed, Chairman, Jamuna Bank Foundation, presided over the programme. Shafiqul Alam, Managing Director and CEO, Jamuna Bank and Mirza Elias Uddin Ahmed, Additional Managing Director, Jamuna Bank were also present as special guest.